China factory blast death toll jumps to 64, man rescued after 40 hours - Integration Through Media ....! BEIJING, (AFP) – The death toll in a chemical plant explosion in China rose to 64 Saturday but rescuers found a survivor among more than two dozen still missing in the debris of one of the country’s worst industrial accidents in recent years. 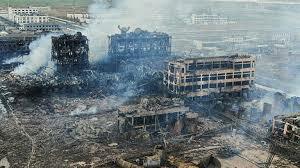 Thursday’s explosion in the eastern city of Yancheng injured hundreds and flattened an industrial park. The local fire brigade pulled a man in his 40s from the rubble of the destroyed chemical plant around dawn on Saturday, according to a statement on the city government’s official Weibo account. Rescuers are looking for 28 people who are still missing, Yancheng mayor Cao Lubao said in the statement.”The identities of the dead and the missing are being confirmed through interviews with family members, home visits and DNA tests,” Cao said. More than 600 people have received medical treatment following the blast, according to the city government.Among them, 21 are critically injured and 73 are seriously injured, the statement said. The explosion toppled several buildings in the industrial park and caused a huge fire that raged through the night, while rescuers scrambled to find survivors in the plant’s wreckage. The force of the explosion — which was so powerful that it apparently triggered a small earthquake — blew out windows and dented metal garage doors of buildings as far as four kilometres (2.5 miles) from the site. Nearby residents — many of them elderly — were seen sweeping up glass, and in some cases appeared to have abandoned their homes entirely. The city government said some 89 houses were damaged beyond repair and families were resettled after demolishing those structures.The government said it was also repairing blown-in doors and windows in 10 school buildings near the site so that all schools in the area can resume classes Monday. Tianjiayi Chemical has a history of violating environmental regulations, according to online records from Yancheng city’s environment and ecology bureau.In 2015 and 2017, the firm was fined for violating rules on solid and water waste management. According to a report released Friday by Jiangsu province’s ecology and environment department, several rivers near the blast site are contaminated with chemicals, including chloroform and dichloromethane. An aerial view of the blast area showed a large swathe of destruction in the industrial park, where multiple fires had raged.Firefighters extinguished the blaze Friday after battling raging flames through the night. Three chemical tanks and five other areas had been on fire. In November, a gas leak at a plant in the northern Chinese city of Zhangjiakou, which will host the 2022 Winter Olympics, killed 24 people and injured 21 others.In 2015, China saw one of its worst industrial accidents when giant chemical blasts in the northern port city of Tianjin killed at least 165 people.